Rain went away overnight and we woke to sun. Good day for a trip to the coast. 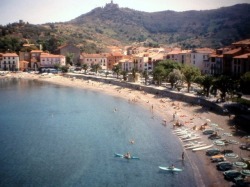 Left at a record-early time of 9:30 and headed to Collioure via Perpignan. Made Perpignan in about an hour, successfully negotiated about 20 roundabouts and headed south to Collioure near the Spanish border. I guess we got into town around 11 – 11:30. After parking, we went to the large open-air market (it was market day.) So much stuff to buy, so little time left on the trip. We did manage to buy an assortment of olives (delicious), lots of soap to display in our new kitchen, ½ dozen oysters on the half shell (delicious and only $2.25) and bread. Had a picnic overlooking the harbor. It would have been a better choice to eat in a restaurant but we had brought cheese and potato salad with us, not knowing what Collioure was like, or even if we would be there for lunch. Kristen and I splashed around in the crystalline waters of the Mediterranean a while. Walked around among the shops. Had sorbets (raspberry, walnut, banana.) took Kristen to a playground (the French seem to be building more and more.) The town is pretty and not destroyed by tourists. It’s probably great in the morning and evening when the daytrippers are gone. Home of Matisse and the “Fauves”, part Catalan, part French, bright, colorful, clean… but time to go. Headed south down the coast with some nice views. Crossed the Spanish border (the border post is now a money changer), hung a U-Turn and back up the coast to Banyuls. Following Thomas Cook’s directions, took the D86 inland for coastal views. The views also made the heart pound, as they were spectacular – up and down the coast as far as you could see in the slight haze. Unfortunately we ran out of film. After about an hour we were back on terra firma. By now it was around 5 or so and time to head back. Stopped on the way for Kristen’s highlight of the day – a McDonald’s with a Ronaldland play room. She had a great time running around with the French kids. There were about 3 birthday parties going on simultaneously. Back home for a beer and a cigar, and another good dinner at Au Pierre Lys. Very good again. On the way into the house, as we drove down our 1 lane street, I had to stop for a dog who wouldn’t move until his owner called him from inside where they were eating. Kristen was uncharacteristically bad at dinner and wouldn’t eat. Dave – salad, escargot and cassoulet – excellent. Kristen liked her first escargots. Grand Marnier crepes for dessert. Jill salad, confit de canard, melon with Muscat, lime sorbet. Also very good.